Florida is lucky to have had three women — three Marjories — speaking out about saving Florida's natural environment. 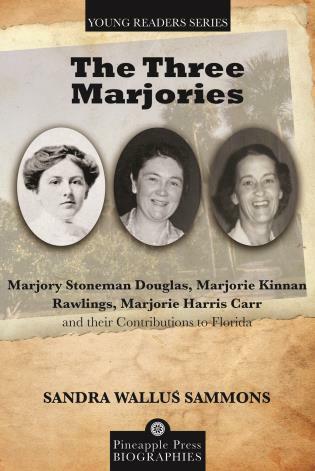 Marjory Stoneman Douglas is known as the “Mother of the Everglades.” She wrote The Everglades: River of Grass, the seminal and now classic book on this unique region of south Florida. She was a tireless campaigner for the environment and helped make the Everglades a national park. Marjorie Kinnan Rawlings is best known for her books set in Florida: The Yearling, Cross Creek, and South Moon Under, all set in the then-remote wilderness of central Florida. Her very popular books brought the world's attention to the importance of the culture and natural environment of this region. Marjorie Harris Carr fought to save the Oklawaha River by challenging the building of the Cross Florida Barge Canal. She argued that this would cut the ecology of the state in two, particularly ruinous for the wildlife. Now there is the Marjorie Harris Carr Cross Florida Greenway, which serves as a bridge for wildlife through developed areas and over I-75. Sandra Wallus Sammons was a Florida elementary school librarian in Lake County for many years. Learning of the dearth of books on Florida history aimed at fourth graders, she began writing biographies of Floridians who lived fascinating, inspirational lives. She has written all the books in the Pineapple Young Reader Biographies series: Marjory Stoneman Douglas and the Florida Everglades, Marjorie Kinnan Rawlings and the Florida Crackers, The Two Henrys: Henry Plant and Henry Flagler and Their Railroad, Henry Flagler: Builder of Florida, Ponce de Leon and the Discovery of Florida, Zora Neale Hurston: Wrapped in Rainbows, and John and William Bartram: Travelers in Early America.